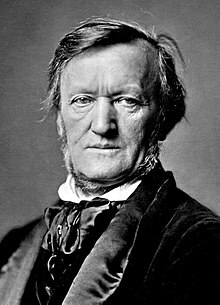 Richard Wagner (22 May 1813 Leipzig me – 13 February 1883 Venice me) ek German opera composer rahaa. Uu Romantic period me Germany ke sab se achchhaa composer rahaa. Uu music ke chorr ke jiske uu aapan school ke time likhis rahaa, uu das opera likis rahaa jiske aaj kal bhi perform karaa jaawe hae. Uske jaada opera me German mythology ke baare me khissa rahaa. Uu sab time aapan word me likhat rahaa aur logan ke idea ki opera kon chij hae ke idea ke badal diis rahaa. festival. 24 orchestral Overture in E minor and Theater Music to Raupach's "König Enzio"
33 aria Aria No. 15 (Aubry) "Wie ein schöner Frühlingsmorgen" from the opera "Der Vampyr" by Heinrich Marschner with a new allegro "Doch jetzt, wohin ich blicke, umgibt mich Schreckensnacht"
34 arrangement Instrumentation of a cavatina from Bellini's "Il pirata'"
36 Music to the Festspiel "Beim Antritt des neuen Jahres 1835"
46E arrangement Arrangements of Halévys "La reine de Chypre"
62E arrangement Arrangements of Fromental Halévys opera in five acts "La reine de Chypre"
76 Oper ? Friedrich I. ↑ The numbers given for Richard Wagner's works are from the Wagner-Werk-Verzeichnis (WWV).